(l-r) Tracy Carman, Media Preservation Foundation, Jim Wells and Jodie Lyons, Futursonic Productions. When this photo was taken in 1995, Jim and Jodie hadn't seen each other in 30 years. Don Worsham doing sound stuff. Futursonic's Versatiles vocal group, 1960. (l-r) Jodie Lyons, Brian Beck, Libba Weeks, Jerry Whitman and Judy Parma. The Media Preservation Foundation, a not-for-profit organization dedicated to the preservation of media archives, is a labor of love for Tracy Carman of Massachusetts and Don Worsham of California. In 2000, while tax-exempt status was pending for REELRADIO, Media Preservation Foundation established a fund for contributions to keep the REELRADIO web site online. Radio station airchecks, radio station production, radio shows, commercials, jingles, et. al. Print media, such as newspapers and historic photo archives. Visual materials, such as old television programs on both film and magnetic media, film libraries, commercial productions, et. al. The Foundation's objective is to "acquire the items before they make their way to a dumpster." It is the Foundation's intention to make these archives available to the public for research and educational purposes. The Foundation has received both financial and material contributions to date from the Estate of Ron Lewis; the Estate of Edith Siday; Brian Beck; Ed Brouder of Man From Mars Productions; Bob Craig of WPEN Radio; Ken R. Deutsch of Ken R., Inc.; Ben Freedman of Ben Freedman Productions division of CPMG, Inc.; Chuck Herlihy of WEAT/WIRK Radio; Radio Historian Peter Kanze; Jack Kratoville of New York's WLTW (Lite-FM); Bill Shannon of Charleston's WXLY; Doug Allen Wedge; Jodie Lyons and Jim Wells, both formerly of PAMS Productions and Futursonic Productions; and Jonathan M. Wolfert of Jam Productions, Inc. amongst countless others. Near the end of 1958, Merriman created a new package for WHBQ (Memphis), one of the Don Lee RKO stations. It was CRC Series 8, featured here. This was the original "Wonderful" package and it featured Merriman's distinctive "dance band" style of arranging. San Diego station KCBQ received this package. In addition to pilot station WHBQ, CRC Series #8 ran on WDGY WBZ, WAKE, WISH, KIOA, WODY, KRIO, WADO, WKHM and nearly every major Top 40 station in the country. Futursonic's unique tight vocal harmony is heard in "Swingin' Sound." The package (heard here for WMAK, Nashville) was only the fourth ID series produced by Futursonic. It was created near the end of 1959. Many of the cuts were also created by Jodie Lyons (see "The Versatiles Days of the Week", below.) The package contains the first cuts written by Lyons. 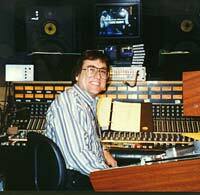 Overall creative control of Futursonic was in the hands of Jim Wells. He and Jack Alexander started the company in 1958. Both came from PAMS where Wells had written much of PAMS Series #6. Alexander was part of the PAMS sales staff. Futursonic's first package was "Pacemaker" produced in September, 1958. It was followed by "Most Happy Sound" for CHUM in mid 1959, and "Econo-Pack" for WINS in June, 1959. These packages slowed CRC's growth and cut deeply into the PAMS market. All were designed for Top 40 Radio. Futursonic's "Days Of The Week" was written by Jodie Lyons and produced in December 1960 in Los Angeles. This demo includes KLIF, WKMH, and CHUM. It featured 4 vocal styles: Kirby Stone Four, Hi-Los, McGuire Sisters, and Four Freshmen. These were later heard in PAMS famous Jet Set, Go Go, In Set, and Music Explosion packages. These were among the biggest and best known packages PAMS ever produced. Jodie Lyons was one of the writers for these and many other PAMS packages. Short versions of the jingles, known as "KWIK IDEEs" created an additional 21 cuts with alternate lyrics. Nearly 200 stations had this package on the air. An example of the "Kwik IDEEs" is included in Mike Larsen's 1962 KROY aircheck in the Repository. Jodie Lyons has retired from University teaching to move to Georgetown, Texas. He is working on a new textbook titled Scoring for the Vocal Ensemble, writing some things for publication, performing with a guitar/woodwinds/vocal duo, playing golf every chance he gets and seeing a lot of his grandkids. PAMS Series 18 was written by Euel Box. This was the fourth series since PAMS instituted the variable logo. The idea behind the logo was to write a bass/rhythm section of the track which could have virtually anything sung over it. Many stations incorporated local songs about their city/state into their logos. For example, WABC's "Seventy Seven" is musically "I'll Take Manhattan". Some stations used logos they'd been using with prior producers for decades. When WNBC decided to do resings on the classic PAMS tracks, they utilized the NBC network chimes. Musically, the chimes were G-E-C... for General Electric Corporation... who owned NBC prior to RCA (in that era). When I was working on The Pete Townshend Special, I asked Tracy Carman of Media Preservation Foundation to contribute a quick copy from his PAMS reference tapes for Radio London, "Wonderful Big L", the legendary pirate station. I had some technical problems in the transfer, and some of the cuts are a bit gritty, fidelity-wise. But I used all but a few in this composite. I doubt the dramatic Series 17 tells you more, says it better voice-over stuff was ever used as it is presented here. (Who was the voice?) And the if you wanna sell in England finale made me wonder: How the heck can you (legally) sell radio time on a Pirate station? Dan Ingram performs The Make It Fit Blues over a PAMS Series 29 pre-record. Tracy Carman writes, "I think this cut is self-explanatory." Here are two different EBS Test jingles sold by TM Productions® in the seventies. Note the typically well-rounded TM voices! There were a couple of alternate versions utilizing a sonovox, too. Ron Harris provided this to the Media Preservation Foundation. The late Charlie Parker, legendary WDRC Program Director, originally envisioned this piece for the 16th Anniversary of WDRC's switch to Top 40 (August 18, 1976). It was produced by Dave "Doc" Overson, Production Director at WDRC at that time, and includes an amazing number of airchecks going back to 1963, most of which were supplied by Ed Brouder, now of Man From Mars Productions. Included are Ron Landry, Dickie Robinson, Joey Reynolds, Sandy Beach, and many, many others. "Big D" was noted for keeping ALL of their archives.... at that point in time. Odds are they've since landed in private collections and won't see the light of day in our lifetimes. Modern ID jingles use a musical logo which is sung with the call letters. The first company to do this was Johnson Siday in 1954, in jingles done for WWSW. Their primary work was in advertising. They created the 1939 "Pepsi Cola hits the spot" commercial jingle and went on to develop the musical logo in their commercials. Eric Siday called the musical logos "Identitones" His work is featured in this demo tape which includes the famous ABC Radio news logo used for many years to introduce the network news at :55. Siday is considered a pioneer in the development of electronic music. His use of the Moog, filters, reverse taping, and recording off speed are all shown in his 1968 "Identitone" demonstration tape. I don't remember when I received this contribution from Tracy Carman, but it's part of the Media Preservation Foundation's vast library of material donated for non-profit use. This is an outstanding composite of WCBS-FM in New York City. It begins with Morning Mayor Harry Harrison on Friday, June 6, 1986, and continues with that day and portions of the week before and the weekend that follows. Great jingles, a few classic spots, and notable supporting players (not listed here) - a first-class radio station. "This is an aircheck from the day the music died: WNBC - The First 66 Years. It was contributed by Peter Kanze who provided the bulk of actualities and airchecks for the special, which is narrated by Dale Parsons. Dale is now in Hawaii, doing consulting, voice overs and enjoying the weather. I remember sitting in my car, in the rain, listening to Alan Colmes do the final ID. They played the NBC chimes (the musical notes G E C, for General Electric Corporation) ... followed by the start of Sports Radio 66 - WFAN." This special aired on October 7, 1988, from 12:10 pm - 1:40 pm. In November of 1998, the Repository was delighted to receive TC's 1998 PAMS Sampler. This REELRADIO exclusive was assembled by Tracy Carman, of the Media Preservation Foundation. Enhanced for those with G2 capability (up to full 16 Khz response if you can maintain 32 Kbps), this bountiful and clever composite includes many PAMS jingles for at least a hundred radio stations. (We didn't count, but it's a bunch.) We remind you that all PAMS jingles are the copyrighted property of PAMS of Dallas. We hope we're on the mailing list for the next TC sampler! For now, Enjoy! Tracy Carman of the Media Preservation Foundation keeps our memories alive with Part 2 of TC's 1998 PAMS Sampler. It's another REELRADIO exclusive with SO much that patience is the payoff. If you don't stick with it, you'll never hear the rare KRTH or ... At 20.7 G2 (or better) the vast variety becomes the ultimate treasure. Sounds GOOD if you can stream on the high side. Enhanced for those with G2 capability (up to full 16 Khz response if you can maintain 32 Kbps), part two of this sparkling salute includes more classics than you can shake a stream at. The NAB finale that claimed my quote is only an itsy-bit of a big, BIG Memorial Day 1999 treat, courtesy of the Media Preservation Foundation. Gosh, you must listen. Please do. PAMS jingles are the copyrighted property of PAMS of Dallas. Reel Top 40 Radio Repository ©1996 - 2011 REELRADIO, Inc.